Capital Credits | Grand Valley Rural Power Lines, Inc.
It’s time for you to get the credit —capital credits, that is― for helping build, sustain, and grow your local electric cooperative. This year, Grand Valley Power retires – or pays by cash– over $1 million to our members like you. You share in the financial strength of your cooperative. When you signed up to receive electric service from GVP you became a member of an electric utility. While investor-owned utilities return a portion of any profits back to their shareholders, electric co-ops operate on an at-cost basis. So instead of returning leftover funds, known as margins, to folks who might not live in the same region or even the same state as you do, GVP allocates and periodically retires capital credits (also called patronage dividends, patronage refunds, or patronage capital) based on how much electricity you purchased during a year. GVP members will receive capital credits retirements by mail, reflecting their contribution of capital to, and ownership of, the cooperative. The capital provided by members help us keep the lid on rates, and reduces the amount of money needed to borrow from outside lenders to build, maintain, and expand a reliable electric distribution system. 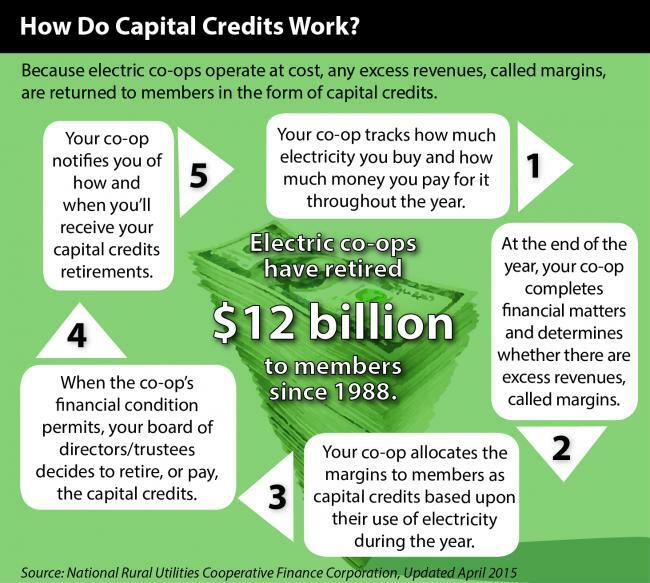 An electric cooperative operates on an at-cost basis by annually “allocating” to each member, based upon the member’s purchase of electricity, operating revenue remaining at the end of the year; later, as financial condition permits, these allocated amounts—capital credits—are retired. Capital credits represent the most significant source of equity for GVP. Since a cooperative’s members are also the people the co-op serves, capital credits reflect each member’s ownership in, and contribution of capital to, the cooperative. This differs from dividends investor-owned utilities pay shareholders, who may or may not be customers of the utility. Margins are allocated to members as capital credits based on their purchases from the cooperative—how much power the member used. Member purchases may also be called patronage. GVP strives to return capital credits to members on a 20-year cycle, with the oldest credits paid out first. Each year, the GVP Board of Directors makes a decision on whether to retire capital credits based on the financial health of the cooperative. During some years, the co-op may experience high growth in the number of new accounts, or severe storms may result in the need to spend additional funds to repair lines. These and other events might increase costs and decrease member equity, causing the board to reduce the capital credits retired in a given year. For this reason, GVP’s ability to retire capital credits reflects the cooperative’s strength and financial stability. The board alone decides whether to retire capital credits. The GVP Board of Directors makes a decision each November whether or not to retire capital credits. When the cooperative is strong enough financially and member equity levels are high enough, the board directs staff to retire some portion of past years’ capital credits. If you move or no longer have electric service with GVP, it is important that you inform the cooperative of your current address, so that future retirements can be properly mailed to you. If you purchased electricity during the years being retired, then you are entitled to a capital credit retirement, even if you move out of the GVP service area. If we have your current address, then we will send your retirement check by mail. WHAT IS THE MINIMUM CHECK AMOUNT FOR A HOUSEHOLD TO RECEIVE? The minimum a member will receive is $15.00. Members traditionally receive a check in December. Due to the expense involved in processing printed checks, $15 is the minimum retirement check amount that will be issued to members. Retirements less than $15 are accumulated year-to-year until the sum is equal to or greater than $15. WHAT IF I RECEIVED A CHECK THATS IN THE WRONG NAME, OR A DECEASED MEMBER? Please contact our main office at 970-242-0040, or stop by at 845 22 Road, Grand Junction, Colorado. We can help you further with these situations. Over the years, GVP has returned over $1 million dollars in capital credit payments to both current and past cooperative members. Unfortunately, we can’t always find everyone who has earned a capital credit if we do not have the correct address on file. We continue to keep an updated list of unclaimed - or un-cashed - capital credit checks. Enter your last name or first name below to search for any unclaimed capital credit checks. If you find your name listed, please contact GVP at 970-242-0040 to claim.